Marketing really works. We're not the type of people who walk down the icecream aisle in the supermarket—the boxes tend to sit in our fridge, just taking up space and getting more and more frosty—but we went and spent $14 on those new limited edition pink and black Magnums the other day. Huge billboards at major intersections. 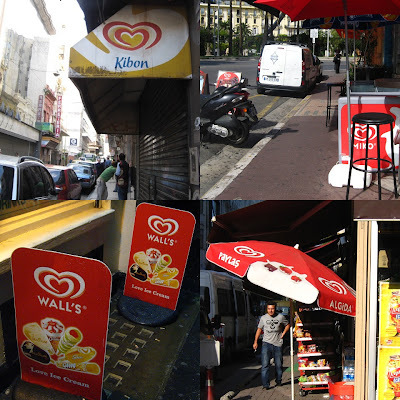 As soon as we started seeing the advertising for these new products a month or so ago, on giant billboards as well as in dairies and bus stops, we just had to give them a go. How's "Marc de Champagne" for an exotic sounding flavour? And wouldn't "Black Espresso" be just absolutely decadent? Sandwich board outside a local dairy. These icecreams also happened to be on special at our local supermarket, which sealed the deal. We took home a beautiful black box (nice and flat for easy storage in our freezer) for something like $7 for four sticks. The design was a delight to behold. Inside the sleek box sat the individually-wrapped portions. When you open one of the foil packets, you notice that the wrapper has a gold lining, and the icecream has an "M" proudly stamped onto one side. Unfortunately, the flavour was rather underwhelming. The overriding taste was that of the dark chocolate coating, which is similar to eating Whittaker's 72% dark ghana. In order to experience the icecream inside, you needed to remove the outer layer first. Then it is pretty much just your usual icecream with a few swirls of coffee, light in colour as well as flavour. Did this stop us wanting to try the pink version? Not at all. The fruit and vege shop down the road sells single servings, so we thought we would just have one each, rather than a whole box. Turns out they were $3.50 per portion, so we might as well have bought the box for the price of our two icecream sticks. Single servings of Magnum Pink and Black at a local vegie store. These pink beauties have a slick of edible metallic paint on the outside (a "pearlescent pink coating" according to the label), which comes off on your fingers, a bit like eye shadow. They looked amazing, but again, under that gorgeous exterior, they didn't really taste like very much. I certainly would never have guessed "champagne" if I hadn't been told beforehand what flavour to expect. We have probably seen the billboards in other places too, not to mention the signage at practically every dairy. That marketing budget must have been huge! Bus stop outside our local supermarket. I have to admit I have a fascination with the Heartbrand in general. Owned by Unilever, it is known as Streets here in New Zealand and Australia, but has many names around the world, from Lusso in Switzerland to Good Humor in North America and China. With such a global brand, I should probably have been less surprised that the pink and black icecreams are not made in New Zealand, but in Germany and Hungary respectively! Heartbrand signage from my travels: (from left to right, top to bottom) Argentina, France, UK, and Turkey. These new products are not bad, just not much more exciting than the other Magnum flavours. I am amazed by how much advertising Unilever is putting into them, but then again, we ended up purchasing something we would normally not have, and I am writing a blog post about it! Marketing works, and the company knows it.